We offer a distinguished range of Stone Marble Inlay Table Top that is manufactured with premium quality raw material, so that long lasting finish and durability is achieved. We offer these Marble Coffee Table Tops in various design, size and color as to fulfill the need of our valuable client. We offer these Marble Table Top at reasonable price. These table tops create a feast for the eyes of others. • Shapes : Round, Rectangular, Octagonal, Oval, Square etc.• Designs : Traditional flooring flower motifs designs, European and pietra dura designs, Italian designs, modern designs, geometrical design. We are providing our customers wide range of Black Marble Inlaid Tables Top. These Inlay Table Tops using high quality semi precious stones and Italian stones raw material. These Table Top can be custom made as per the requirement of our client. Our company is among reckoned manufacturer of exclusive Stone Table Top With Inlay. Designed and developed using superior marble rocks, these Coffee Table Top are aesthetically appealing. 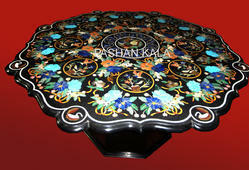 These Inlaid Marble Coffee Table are used to beautify the interiors of hotels, restaurants, lounges, homes and office. We have a wide range of Marble Table Top to choose from. We do complete quality checking of these Stone Inlay Table Tops before supplying these to our valuable client. • Different sizes 12 to 72” inches. With the support of our expertise, we offer White Stone Inlay Table Tops, which is used to cover the table top and is designed as to provide attractive look in the interiors of room. We offer our range is in various color and design, which is hugely appreciated by our esteemed client. 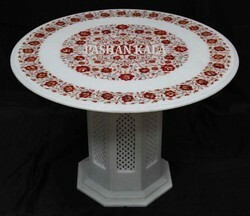 We provide these Marble Table Top in various new designs and colors, at highly affordable rate. Looking for Inlaid Stone Table Tops ?